This is a unique over-the-water new house built on a beautiful small island of 1756 sq mts or almost a 1/2 acre. There is a lookout hill with a thatch rancho for entertaining and BBQ. This island is in a popular area with ex-pats known as “The Cut”. It is only a 15 minute boat ride to Bocas Town in a protected channel between Isla Solarte and Isla Bastimentos. Red Frog marina and beach are only a 10 minute boat ride away. Crawl Cay famed restaurants are only 20 minutes away from the other way. Red Frog Beach has a zip line and nearby Bahia Honda has a bat cave tour. Swim off your deck, fish the little nearby islands, snorkel the nearby reefs, stand-up paddle the clear waters surrounding the properties islands. Plus the owner just recently built a white sandy beach to enjoy. The house is brand new. It features a large kitchen with a dining area. 3 bedrooms with baths. There is also a large living room. A large loft can be used for either an office or an extra bedroom. The front porch is protected from the weather and you can relax looking out at the water. 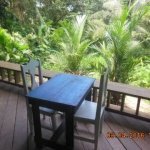 The house is perfect for a family compound or a tourist based business. There is a state of the art Outback solar system with 21 solar panels and 24 batteries. A water catchment system is also in place. The ROP Rights of Possession property has very clean long term ownership and is in a Panamanian Corporation. Remember this is a brand new house so repairs are minimum. Book an appointment with us to boat out and see it first hand.